At the end of 2015 I mentioned some big changes coming for CGT. Although I had an inkling of what was to come, I had no idea at that point the amount of changes that were on the horizon. Consider this: In February, we announced a merger where we became Stagnito Business Information + Edgell Communications. In April, we announced the acquisition of the Path to Purchase Institute (www.p2pi.org), a global association serving the needs of omnichannel retailers, brands and solution providers along the path to purchase. And, in May, we announced the appointment of our new Brand Director, Richard Price by way of Penton (welcome aboard!). Fast-forward two months and we’re now announcing the appointment of Peter Hoyt to CEO of the newly merged companies … what a difference [less than] a year can make! In this industry, we always talk about the astonishingly fast-paced rate of change and how we need to keep up with consumers. 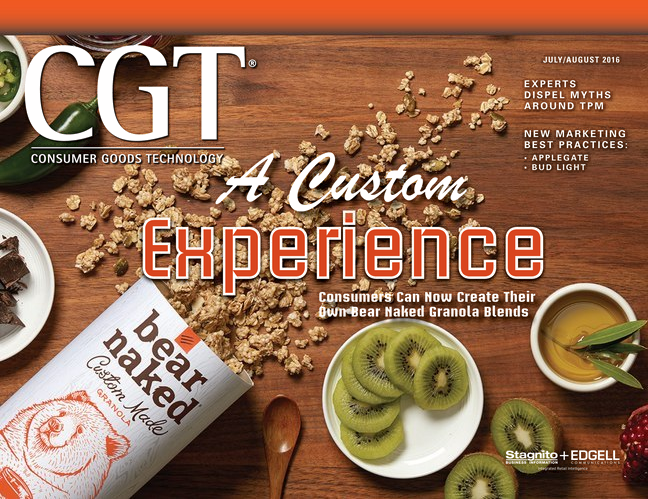 That is why in this month’s cover story, we talk about customizing experiences with Kellogg brand, Bear Naked. Consumers can now choose their own granola blends, in their own custom packaging, and have it shipped right to their door. Similarly, in order to serve the CGT audience better, we are also looking to keep up with our consumers (our readers). In doing so, there will be more changes on the horizon — in the end, we hope to better serve our readers and ultimately remain the go-to resource for all your business and technology needs.